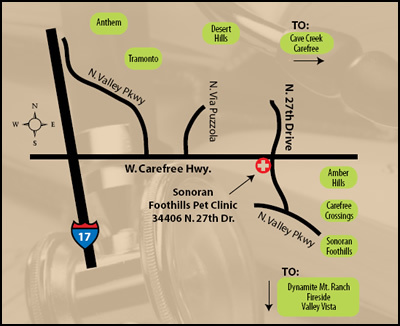 Sonoran Foothills Pet Clinic is located in far North Phoenix at the Southwest corner of Carefree Highway and 27th Drive (27th Avenue) just south of the Walgreens Pharmacy. Our clinic provides veterinary care for dogs and cats to North Valley pet owners, including the communities of Tramonto, Desert Hills, Amber Hills, Carefree Crossings, Sonoran Foothills, Dynamite Mountain Ranch, Fireside, Valley Vista, New River, Anthem, and Cave Creek. We are easily accessed from the Happy Valley Road area via 19th Avenue or Norterra Parkway north to North Valley Parkway, then proceed north to 27th.